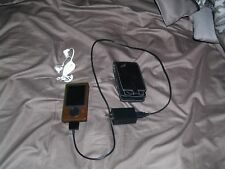 Brown Microsoft Zune 1089 30GB Digital Media MP3 Player very good shape!!! I JUST BOUGHT THIS MP3 PLAYER. IT WORKS FINE. Excellent used condition. Fully tested, and works great. When connected to a PC, the Zune software program shows a picture of a Zune colored black. As you can see, this Zune will easily hold over 4,600 of your favorite songs, as well as photos and videos too, this Zune rocks. Zune 30GB Brown. Microsoft Zune Brown. Zune sync/charging cable. Start Guide. Carrying Pouch (Brown). Product guide. Software CD. Original Box. 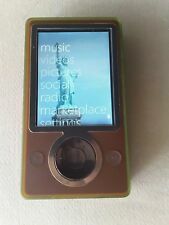 Microsoft Zune Mp3 & Video Player, Brown NO RESERVE! This was opened up when first received, but never used. Take a look at the box pics for all the specific details of this model. ZUNE MUSIC-VIDEO PLAYER 30GB BROWN,USED LITTLE,INCLUDES 30GB ZUNE DIGITAL MEDIA PLAYER,EARPHONES,SYNC CABLE,MANUALS &DISC.COMES WITH BRAND NEW GRIFFIN VIZOR FOR ZUNE LEATHER CASE WITH SECURE CLOSURE AND CLIP.